The year 2009 has not been too good for Bollywood, as some of the most-awaited movies like Chandni Chowk To China and Blue sank at the box office. Trade analyst Vinod Mirani gives us a list of the top 10 flops of the year. Take a look. A copy of Hollywood film She Is The Man, Dil Bole Hadippa did not earn a hit status for its heroine Rani Mukerji. Rani played Veera in the film, who is very passionate about cricket. The only way she can be a part of the local cricket team is if she transforms herself into a Sardar boy. So Veera becomes Veer. Not too long after, she falls in love with the team's captain, played by Shahid Kapoor. Yash Raj Films' bad phase at the box office continued, and Rani found herself slowly slipping off the ranks. Twelve raashees and 13 songs proved to be an exhausting watch for audiences, and they rejected Ashutosh Gowariker's What's Your Raashee? outright. Priyanka Chopra's 12 acts could not save the film either, which was adapted from Madhu Rye's Gujarati novel called Kimball Ravenswood. The film tells the story of Yogesh Patel (Hurman Baweja), who is on the lookout for a bride. He sees a girl from every sun sign to help make up his mind. After the success of Ab Tak Chappan and Chak De! India, expectations were quite high from director Shimit Amin and his new film, Rocket Singh. But the film came and left the theatres without a whimper. Rocket Singh is a story of Harpreet Singh Bedi (Ranbir Kapoor), who gets a job as a salesman. Once in the profession, he discovers its ill practices, and cannot digest them. So he starts his own company Rocket Sales Corporation. Ranbir's third 2009 release -- after Ajab Prem Ki Gazab Kahani and Wake Up Sid -- may not have worked but there's no denyng that the actor has arrived. Nagesh Kukunoor, who gave us such great movies like Hyderabad Blues, Dor and Iqbal, went terribly wrong with 8 x 10 Tasveer. Even Akshay Kumar's star presence could not save the film. The thriller had just too many loopholes. It tells the story of Jai (Akshay Kumar), a man with supernatural powers -- he can get inside a photograph and look into the past of the people in it. He uses this power to help people out. One day, he finally learns a dark truth about his own family. The most expensive Hindi film of the year Blue had no story to speak of -- all it had was stunning underwater photography, excellent stunt sequences and lots of stars. It looked like debutant director Anthony D'Souza spent the entire budget of Rs 100 crores on frills instead of content. Sanjay Dutt plays a fisherman with memories of a sunken ship with treasure in it. 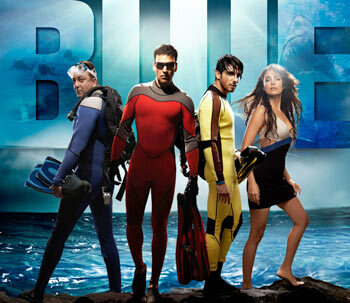 With the help of Akshay Kumar and Zayed Khan, they go treasure hunting. Neither a bikini-clad Lara Dutta nor the beautiful Bahamas could not save Blue. Shah Rukh Khan's only release of the year Billu could not earn him a hit. Though its Malayalam version Kadha Parayumbol was a big hit, its Tamil version Kuselan -- starring Rajnikanth -- also did not work at the box office. Billu saw Irrfan Khan play a village barber, leading a monotonous life with his wife (Lara Dutta) and children. One day, his life turns upside down when his childhood friend-turned-superstar Sahir Khan (Shah Rukh Khan) comes to his village to shoot a film. Akshay Kumar's first first release of the year, Chandni Chowk To China, was a disaster at the box office. The film saw him play Sidhu, a simpleton cook, who worked with his grandfather (Mithun Chakraborty) in a roadside stall. He wants to earn money fast, and soon finds himself a long way from home, in China. The Chinese think he's an reincarnation of a legendary warrior, and ask him to save them from smuggler Hojo (Gordon Liu). Inbetween fighting off the villain, Sidhu finds time to romance Deepika Padukone, seen in a double role. The bad reviews and box office collections notwithstanding, Akshay and Advani are making another film together called Patiala House. Saif Ali Khan and his girlfriend Kareena Kapoor promoted their film Kurbaan aggressively but still could not make it a hit. Even their much-publicised steamy scene in the film could not win them bigger audiences. Kurbaan told the story of Avantika (Kareena Kapoor), who falls in love with a colleague Eshaan (Saif Ali Khan). They marry and shift to New York. That's when life changes for Avantika, as she learns that her husband is a terrorist. The film also stars Vivek Oberoi and Dia Mirza, playing journalists. Usually, Diwali releases always tend to make money. Main Aurr Mrs Khanna is one of the few movies that failed so badly that theatres had to even cancel shows. The film was too simplistic as it told the story of a married couple Raina and Samir (Kareena Kapoor and Salman Khan), who break up when Samir loses his job. Later, he returns to her, and finds her waiting for him. Debutant director Prem Soni obviously had not learnt his craft properly before he started on this venture. Salman Khan may have given the biggest hit of the year in Wanted, but he had to go through quite a few flops first. Filmmaker Vipul Shah, who has regularly churned out hits like Namastey London and Singh is Kinng, finally got it wrong in London Dreams, also starring Ajay Devgn and Asin. The film is about two best friends from Bhatinda in Punjab, who start a rock band in London. But once they taste success, things turn sour. The fact that both are in love with the same woman does not help matters either.